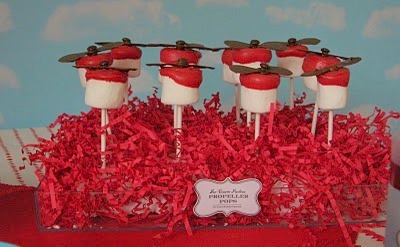 Love this candy airplane party favor! H was given this candy airplane as a party favor. I immediately demanded, "DON'T EAT IT!" She clearly had no clue why. She assumed it was because she didn't need to have anymore candy. Being Katie and loving this kind of silly stuff, I had to take a pic before she devoured the treat! Again, she began trying to unwrap this treat in the car.. I yelled, "NOOOO, you can't eat it yet!" Well, here it is! The airplane party favor made it home safe and assembled for THE pic:) This little guy is so stinkin' cute! String the rubber band through the lifesavers. Loop each side of the rubber band loops around the stick of gum. Slide the smarties in between the lifesavers. Ohhhh Myyyyy Helicopter! I love these marshmallow helicopters! These are impressive! Take a look at her wonderful blog and ideas at Not Just A Mommy! <-----Visit here for the tutorial! C just might be having a Helicopter 1st birthday party in October! Sounds like a partay! Thanks so much for sharing! How cute! Can't believe it made it home unopened! Thanks so much for stopping by and following my blog, Katie...I'm a new follower, too! Thanks, Linda;) makes my heart happy!